Morgan Spurlock's documentary Comic Con: Episode IV - A Fan's Hope is an earnest, humorous, oddly sweet celebration of the annual San Diego Comic Con International (2012's Con is going on right now as I write this) and of the 125,000 geeks, nerds (in costume and out), fans, and creators, who descend upon San Diego to openly celebrate their nerdosity. Filmed during the 2010 SDCC, Spurlock steps out of the spotlight entirely and turns his cameras onto the Con-goers themselves, with many famous nerds and Con stalwarts such as directors Joss Whedon, Eli Roth, Edgar Wright, and Kevin Smith, Stan "The Man" Lee, Seth Green, Seth Rogen, Aint It Cool's Harry Knowles, Morgan Webb of X-Play, comic book writers Matt Fraction and Grant Morrison, and other luminaries of their geeky fields providing amusing insight into the inner workings of the Con and the mindset of their fans. Spurlock follows a few key narrative threads throughout the five days of Comic Con: two aspiring comic book artists hoping to be discovered by the major comic book companies, a costume designer and her team presenting a cosplay (costume roleplay) of the video game Mass Effect to the Comic Con Masquerade, a couple who met at the Con in 2009 and get engaged at this Con during Kevin Smith's panel (Smith got very emotional during the proposal and offered to marry them himself), and the owner of Mile High Comics, America's largest comic book store, who is a 40+ year "survivor" of Comic Con and his hopes for his retail business on the show floor. The Con experience turns out well for some, disappointingly for others, but nothing about the experience crushes their spirits or hinders their desire to return. The truth of how Comic Con has evolved into Hollywood studio-dominated pop culture phenomenon doesn't escape the comic book retailer, who finds far less foot traffic and interest in purchasing and collecting actual comic books when compared to the interest in Hollywood films and the latest pop culture trends. For the comic artist hopefuls, the Con is a series of nerve-wracking meetings with comic book professionals evaluating their work and talent. But for many others, Comic Con is just pure nerd heaven, a place to be whomever and whatever they secretly fantasize being and spend four days with like-minded people "geeking out" over whatever they love, be it comic books, Star Wars, Star Trek, Twilight, superheroes, video games, etc. - anything and everything goes at Comic Con. 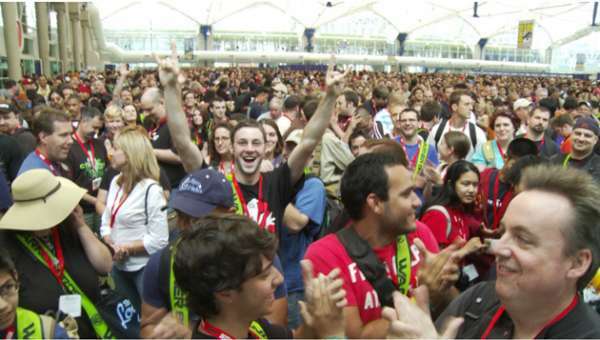 Spurlock finds the humanity in this vast sea of geekery; Episode IV - A Fan's Hope never condescends or casts a cruel light on the people who make Comic Con an annual destination. The documentary casts a light touch and if anything, perhaps it's too breezy. There are only a few odes to the logistical challenges of going to Comic Con, such as the pre-dawn wakeup times, lining up for hours and hours to get into the popular panels (time that is sometimes wasted if you don't get in), the exhaustion of four days on your feet, and the difficulty of getting in proper meals, a wireless signal, or a place to charge your cell phone. Not nearly enough time is spent on what I found to be the most enjoyable aspect of attending Comic Con: just mingling with the legions of cosplayers, seeing them in their costumes, posing for photos with them, and watching them perform in character on the show floor. However, over the closing credits, Spurlock and company did make sure to note the peculiar smells of Comic Con - thousands of people in paint, spandex and rubber, mixed with sweat and the occasional lack of basic hygiene, does unfortunately make for curious, inescapable odors. Overall, Spurlock and friends, who are obviously geeks themselves and proud of it, successfully capture the beating heart of Comic Con. Episode IV - A Fan's Hope is a sincere and terrific tribute to something anyone who calls himself a geek or a nerd should experience at least once in their lives. Odds are, once you do, you get the itch and you want to keep coming back. That's the magic of Comic Con. Also, the documentary is almost worth the price of admission to just to hear Kevin Smith tell the imaginary tale of him visiting his eleven year old self to brag about going to Comic Con and knowing Stan Lee, and how 11 year old Kevin retaliates and changes his future (for the better).